In 1971, there were 17 cars per 1000 inhabitants in Poland. Then came the Fiat ‘Maluch’ 126 revolution: read how the tiny car won the heart of Poles and drove its way into legend. Mocked as a communist fetish of consumerism, desired as an idiosyncratic luxury, the iconic and bijou-sized Polish Fiat 126p took on any and every role required. According to its previous owners and present admirers Maluch - as it was commonly called across Poland - was not just a car, but a lifestyle. In 2013, 40 years have passed since the first Fiat 126p rolled off the assembly line of the FSM plant on the 6th of June, 1973 in Bielsko-Biała, in the South-East of Poland. FSM (short for Fabryka Samochodów Małolitrażowych) was a factory whose name announced the production of small-capacity cars, and it manufactured the vehicles under Italian Fiat company’s licence. 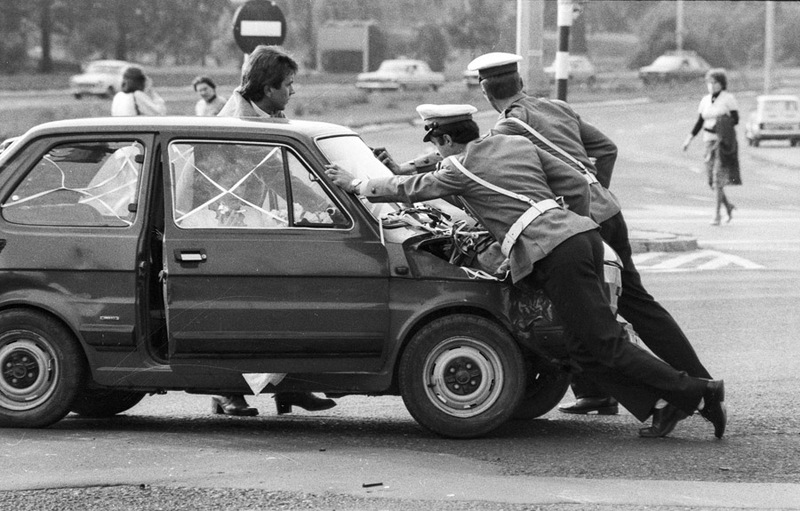 Some stated jokingly that the Fiat 126p became the true fulfilment of the third phrase from the Polish national anthem, 'Z ziemi włoskiej do Polski'. This verse, which means 'From Italian land to Poland' initially referred to the role played out by the Polish Legions of the Napoleonic period, who fought alongside Napoleon in Italy. 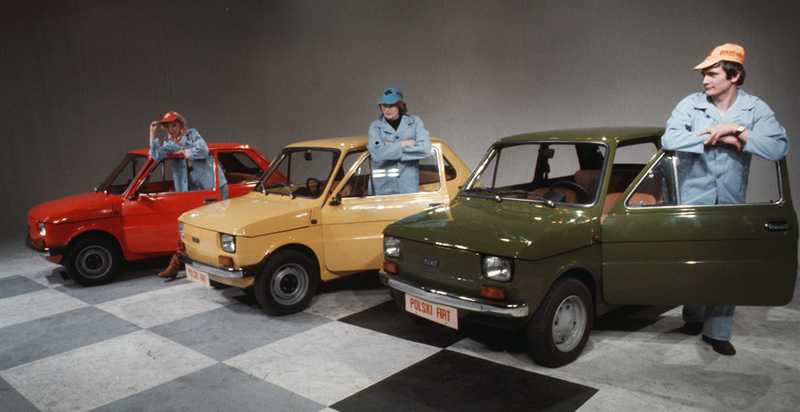 Two years before the first Fiat 126p was built in Poland, there were a mere 556,000 automobiles in the entire country. This was due to the fact that in the pre-1989 communist Poland, not only was car production limited but purchasing a car also entailed significant bureaucratic procedures – or alternatively handy personal connections. The PF 126p was meant to be the first real, popular and affordable car to motorise ordinary families. The licence to produce the Fiat 126 was purchased soon after the arrival into power of Edward Gierek, whose move was a bid to establish an image of prosperity and abundance, in contrast to previous communist leader Władysław Gomułka’s austere policy. The Polish Fiat was commonly referred to as Maluch, a name which means 'Little One' or 'Toddler'. 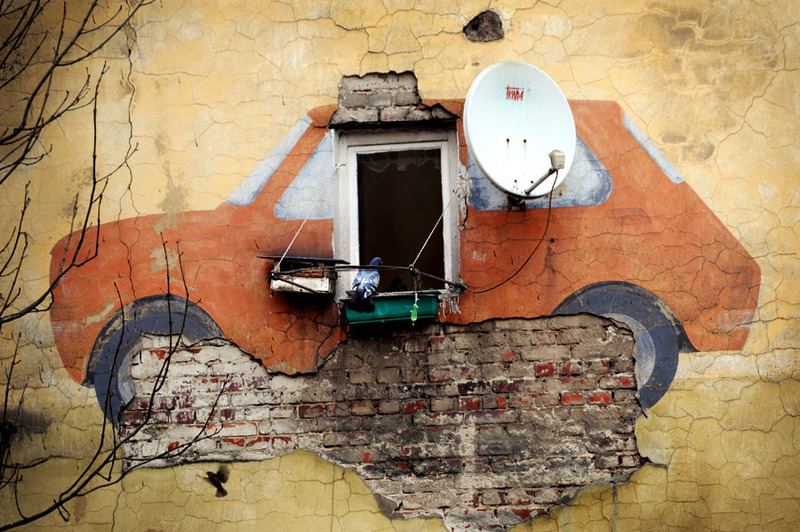 The car remains a symbol for Poles of older generations, as its story is embedded in Polish politics of the communist period. Top Gear presenter Jeremy Clarkson once suggested the real reason Lech Wałęsa stood up to the Soviet Union was not because he wanted to free his land from the shackles of communism, but because he wanted a new car… And although the British journalist has become famous for crossing the line in his side comments, the grain of truth in this one is that Poles did, in fact, wait for years to obtain this miraculously small vehicle. The car gained the name Maluch almost instantaneously and it was also referred to as Kaszlak, literally meaning 'the cougher', due to the somewhat alarming sounds it emitted when the engine was started. In other countries of the Eastern Bloc it also enjoyed a variety of nicknames, such as the Flea, the Iron, the Mouse-Truck, and the Carton. Curiously, it also found market success in Australia between 1989 and 1992, under the name FSM Niki. During that period it was Australia's cheapest car, and there was even a convertible version developed for the Australian market. For many, the car proved a nightmare. More of a Cougher than a sweet Toddler, it would break down a couple of times a month, putting its owners' psyche to a challenging test. In her article for the website of Polish Fiat fans, www.rezerwa126p.pl, journalist Monika Mukonic collected a series of Maluch memoirs from some influential women of today's Poland. They all speak of the experience as if recalling a first love. There were the blood, sweat and tears, and inevitably, a break-up, but there were also the emotions that are impossible to forget. It seems that even the rough side of the experience is now the source of many a smile for the previous owners of the 126p cars and something that may well be exemplary of Poles' astonishing sense of humour. In face of the many breakdowns and visits to the service station, one of Poland's journalists and TV presenters, Magda Olszewska would love to employ culinary comparisons in her debates with the mechanic. A throbbing timing belt was to her the sound of boiling potatoes… And, although there was hardly a Maluch owner that at one point or another, didn't light the car up with a coat hanger or a brush, the car was an institution. The actress Małgorzata Potocka recalls taking her Little One for rides across the city of Łódź, with eleven people mounting the vehicle and drinking up Soviet champagne, going from one house party to the next. The car was thus a pub, a disco and an underground discussion club all in one. It was also what got her her husband. When Józef Robakowski - who also drove a Maluch - bumped into her as she was driving her ten friends around, she felt struck by a lightening and fell in love at first sight. Another phenomenon of humorous resourcefulness was the adventure constituted by packing up for a family holiday. It was a rather common endeavour to fit a four-person family and travel a thousand miles from Poland to Bulgaria, with all the luggage and camping equipment needed for the vacation. When all cracks of the car had been used up, board games, books, and even plates would get stuffed under passenger's seats. Kowalski is driving a maluch and catches up with the newest Porsche. “No, I’m not much of an expert”, replies the Porsche-owner and speeds up to 120 km/h. Kowalski speeds up and catches up with the Porsche. Polish artists of the period were also sensitive to the Maluch phenomenon. To some of them, the popular fascination with this new luxury was a resonance of new communist party leader Gierek's political slogans and games, which announced the rise of a socialist-consumption society. The acclaimed artist Zygmunt Rytka created an ironic film about the phenomenon. By employing close-ups and repetitions evocative of pop-art, Rytka intended to convey what was "the communist object of desire", unmasking the demagogy of authorities with first-class irony. The car is also portrayed in a work by the aforementioned artist Józef Robakowski, the first husband of aforementioned actress, Małgorzata Potocka. In 1978, Robakowski moved into a new flat in a newly built highrise in the centre of Łódź. He began filming the people and events he could see from his kitchen window. The film thus created forms part of a project called My Very Own Cinema, and, spanning across 20 years, it is at once a humble recording and a monumental work. Robakowski declared, 'My Very Own Cinema is what I work on when nothing is working out', and this seemingly simple statement shows it can by filled with multiple layers of subtly wrought meanings. An apparently objective and 'natural' documentation of the outside events conceals a dense tangle of convention. And, as a synthetic and authentic eye captures the world outside Robakowski's window, we witness the images of Maluch cars reiterate repeatedly throughout the slideshow. 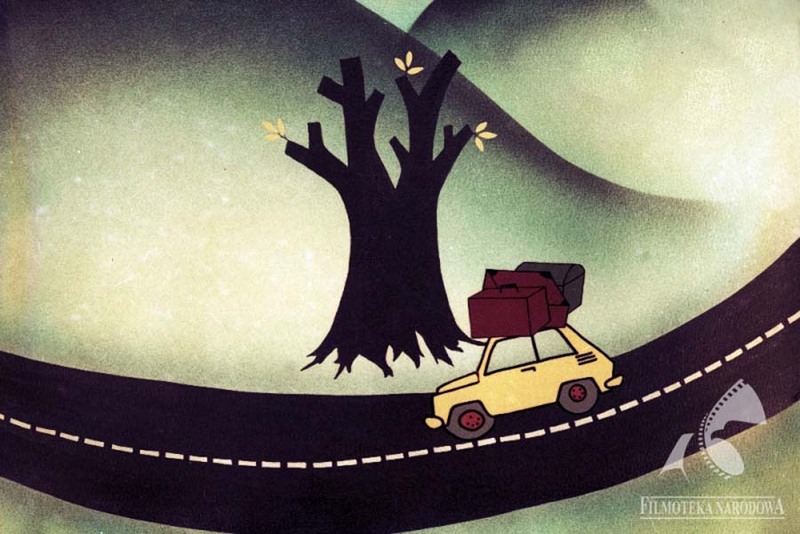 One of the most popular children’s animation films in the Dobranocka series (daily bedtime cartoons emitted by Polish state television precisely at 7 pm), Miś Uszatek, actually devoted a whole episode to the 'toddler' car. Miś Uszatek, whose English name is Teddy Floppy-ear, Pigs and the Bunny get to know all about it in the film below. And at times the Maluch now makes its return as an allegory in the discourse of contemporary art. 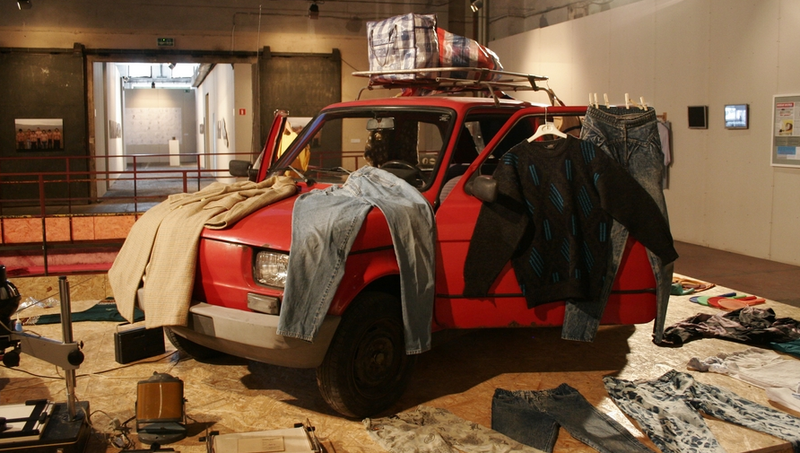 Last year's installation by Volodimir Kuznetsov, hosted by the Polish Institute in Budapest, was entitled Mały Fiat 126p. A Monument of the 1990s. Created in 2011, the installation is seen by art historian Izabela Kopania as part of a wider, international tendency to return to the material substances in art. In literature, as well as the visual arts, there seems to be an intensified presence of objects, one which is coupled with a growing awareness of their ever-changing meanings and historic entanglement. In the words of literary scholar Czapliński, it seems that in contemporary works of Eastern-European artists 'things have become really talkative'. What Kuznetsov makes the Maluch say seems to be that although it is the symbolic object of a past history, this history is intrinsically bound to individual fates and tales that don't cease speaking to us as quickly as political slogans. The PF 126p is also a car that has strongly marked its presence in Polish popular culture. Nie ma mocnych (arguably translatable as The Invincibles) is a film that formed part of the Sami swoi (Own Folks Only) trilogy, directed by Sylwester Chęciński. It tells the epic stories of two neighbouring families and the vicissitudes of their lifes. 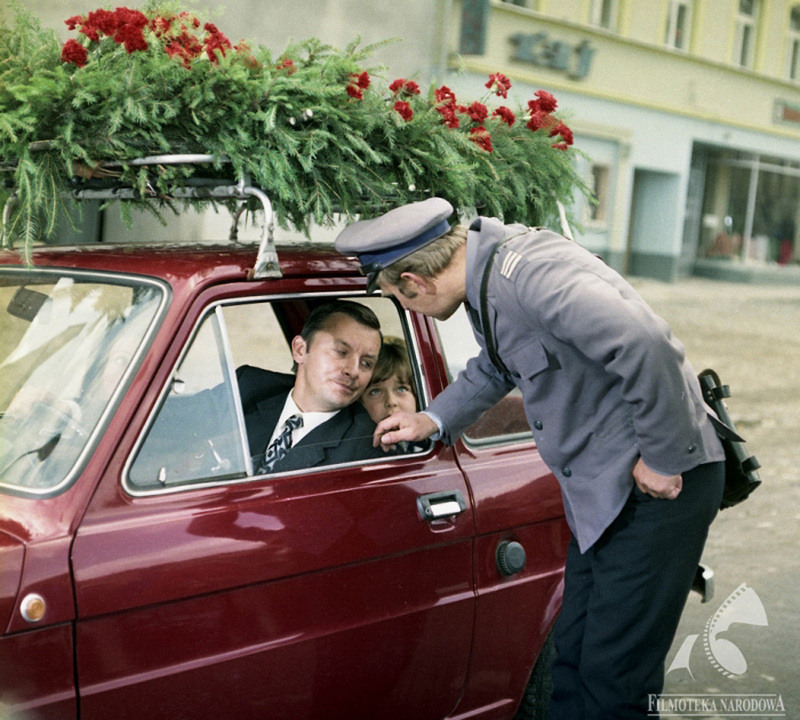 Pictures to Nie ma mocnych were taken in 1973 and it had to be one of the very first, if not the first, film role of the "Mały Fiat" car. In the movie, a dark-cherry Maluch travels across Poland adorned with funeral wreaths. Yet, according to specialists of Internet forums, the version seen here is so early, that it most likely isn't yet one made in Poland. The details like white indicators, the lack of mudflaps, indicate it is one of the 'information series', built entirely in Italy. 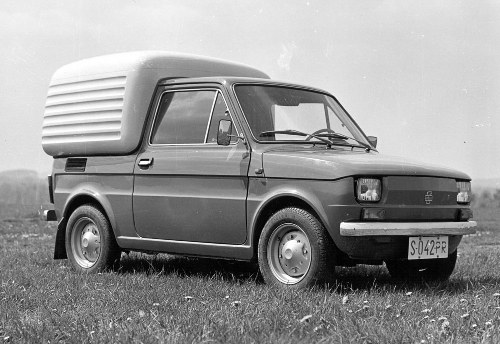 These vehicles were delivered to Poland around November 1972 and were then used as promo 'show cars' across the country. The car was owned by an iconic figure of Marek Koterski's series of films, Adaś Miauczyński - the frustrated and lost Polish intelligentsia man, hailed by the critics the living emanation of the dark and subconscious side of every Pole… In a scene from the Nic Śmiesznego (Nothing Funny) film from 1995, the Fiat 126p is in the spotlight of a scene that teaches us where the name Cougher came from. Few people nowadays know that the car could be started just like a… lawn mower. Bombels were used first and foremost by the sports section of the FSM, as service cars during car races. Later on, the Ryjek (translatable as a ‘Snoutie’) emerged, which had the engine in the front of the car, with flat cargo area in the rear where the original 126 had the engine. The mask had to be lengthened by some 19cm to fit the engine, hence the nick Ryjek, which means little snout in Polish. There was also an off-road version propelled by caterpillar tracks. Nowadays it seems that old Fiat 126p snowploughs are hugely popular on the Allegro auction website (a Polish version of e-bay) - and the reason for this is quite simple, as they are in fact the cheapest ones available on the market. Maluch isn't a car. It's a lifestyle. The Museum on Kapracka Street in Bielsko-Biała boasts a military Polish Fiat which was made for the army, for which there are also detachable caterpillars and a snowplough. There is the elegant 1999 version, created a mere 11 months before the shutting down of the 126p production, as well as a pick-up model meant for the Polish Post. Presently, it plays the role of a marten-buster, as Przechodzień also builds pest repelling devices, fighting mice, martens, moles and insects. Each of the four vehicles is registered, insured, and has undergone restoration, which makes it available for a ride anytime. The 40th anniversary of the car in 2013 also coincided with a chance discovery that was very widely commented on in the Polish media. A 34-year-old "brand-new" Maluch was discovered in the barn of a house, where it had been stored, unbeknownst to the inheritor, since its purchase. The first owner - who bought the car straight off the production line - only drove it back to his house in the town of Piotrków Trybunalski, and put it away - most likely due to the fact that he didn't actually have a license. The 60-year old second owner inherited a house with a garage, and with it - its content, the car, which was covered with old carpets and rugs. Because the garage was located right next to the boiler room, it provided excellent conditions and not a sign of rust was visible on the body. Augustyniak, the third owner of this automobile treasure, put up the car for an auction of our curiosity. He claims he didn't really have the intention to sell his find, but he was curious what the offers could be. A record sum bid went over a billion Polish zlotych, but Augustyniak decided to delete all offers that exceeded the equivalent of 150 thousand PLN (about 45 thousand US dollars), judging them a prank. Nonetheless, the car, with its original and clear engine oil, chrome bumpers, and plastic foil still protecting the seats, is a precious collector's item. The highest, and, apparently confirmed offer that the car is said to have gone for amounted to 280 000 PLN, an amount exceeding 86 000 USD.